Extra Features: MTB Style Tyres. 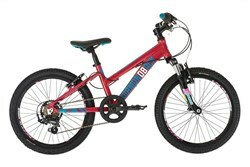 What is a Kids Bike? Bikes ranging in wheel sizes from 12 (normally for riders aged 3 to 5 years), up to 20 (normally for riders aged 6 to 9 years). The correct size would be determined by the height of the rider. Designed in girls and boys models and also in a number of styles.